Slovakia Government's Collapse Not Enough To End Protests Over Journalist's Murder : Parallels An investigative journalist and his fiancée were killed, sparking a political upheaval. But that failed to quell the largest protests in the Central European country since the 1989 Velvet Revolution. 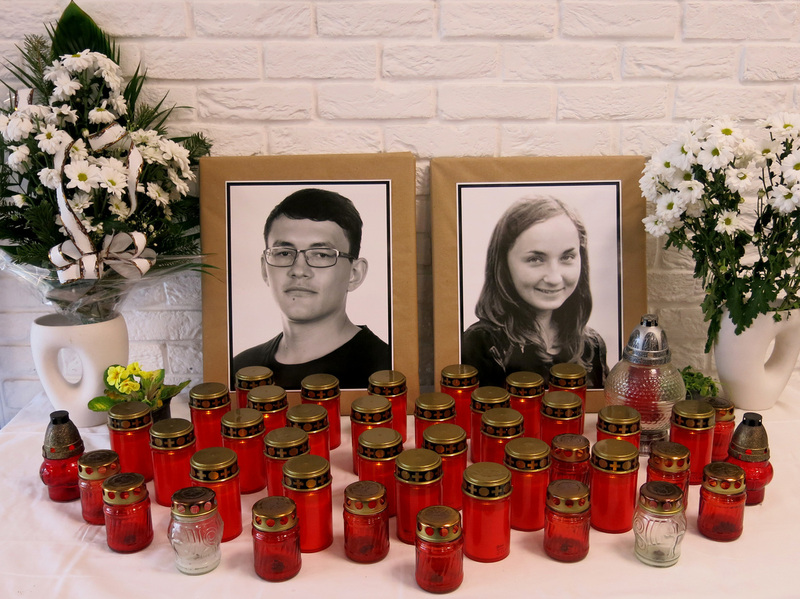 A memorial to slain journalist Ján Kuciak and his fiancée, Martina Kusnírová, has been set up in the lobby of Aktuality.sk. Since they were killed, the news site's office building has been guarded by the police and private security guards. A love story turned murder mystery led to the collapse of Slovakia's government last week. But that failed to quell the largest protests in the Central European country since 1989, when the Velvet Revolution brought down communism there. The prime minister-designate, Peter Pellegrini, who was a deputy to his predecessor, Robert Fico, is now scrambling to form a new government to calm the situation. Pellegrini's original picks for his cabinet were rejected by the president and he plans to discuss new names on Wednesday. 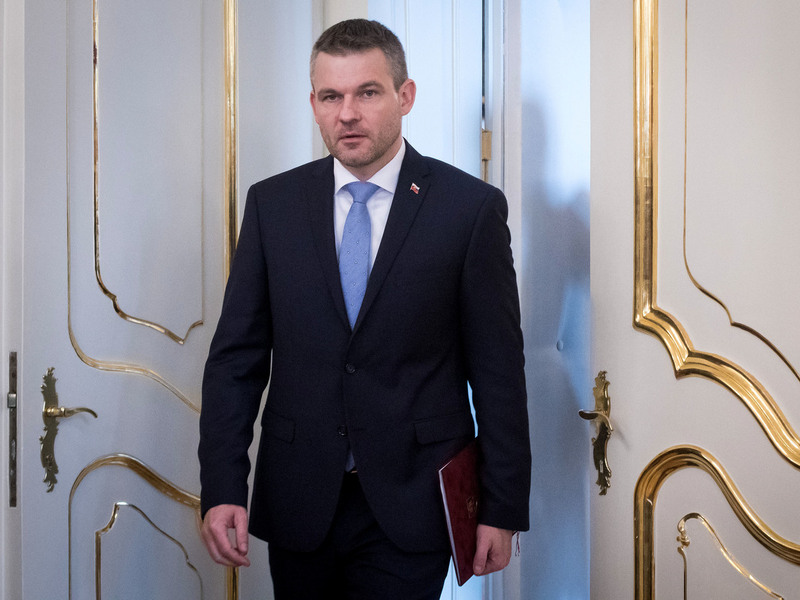 Pellegrini is also hoping to restore public trust in his political party Smer-SD or Direction - Social Democracy — a successor to the communists — as well as the other factions that form Slovakia's governing coalition. The catalyst for the public outrage in the nation of 5.4 million began in what nowadays is a heavily guarded newsroom at Aktuality.sk, an online news site run by a Swiss-German media conglomerate. There, Ján Kuciak, 27, was part of a three-member investigative team covering corruption in the Slovak government and business community. It was a formidable task in a country where corruption is deeply ingrained in society, a holdover from communist times. Things were so bad that then U.S. Secretary of State "Madeleine Albright had called Slovakia the 'black hole' of Europe [in the late 1990s] — and for good reasons," said Jozef Bátora, a political science professor at Comenius University in Bratislava. "This kind of malpractice has been developing in all parts of the society," he added. "Wherever you want to do something in public offices, very often you are sort of expected to pay a little bribe." Kuciak was determined to uncover just how deep the corruption went. He was a rising star in Slovak journalism known for his reporting on the Panama Papers, leaked documents published in 2016 that showed where wealthy people worldwide hid their assets. Friends and colleagues say Kuciak was gifted at crunching numbers. "Our editor-in-chief used to joke that he was the most terrible journalist when it came to writing, because when he was looking through the data he always found a lot of connections and wanted to put everything on paper, so to speak," recalled Peter Habara, an editor at Aktuality.sk. "Ján was a dedicated person — not only a journalist, but a dedicated son of Slovakia, if we can use this term, because he was trying to make this country better," Habara said. Kuciak also rattled the political and business establishment. Kuciak told Slovak prosecutors last fall that he received a threatening phone call from local businessman Marián Kocner, Habara said. Forty-four days later, authorities had failed to act on that report, Kuciak wrote in an Oct. 20 Facebook post. The businessman allegedly threatened to set up a website smearing Kuciak and others reporting on his case. But it was Kuciak's last story that investigators suspect ultimately cost him and his fiancée, Martina Kusnírová, their lives. Police discovered their bodies on Feb. 25 in the white bungalow they'd been renovating since last summer in the small village of Veľká Maca in southwestern Slovakia. He was killed with a gunshot to the chest and she, with a bullet to the head. 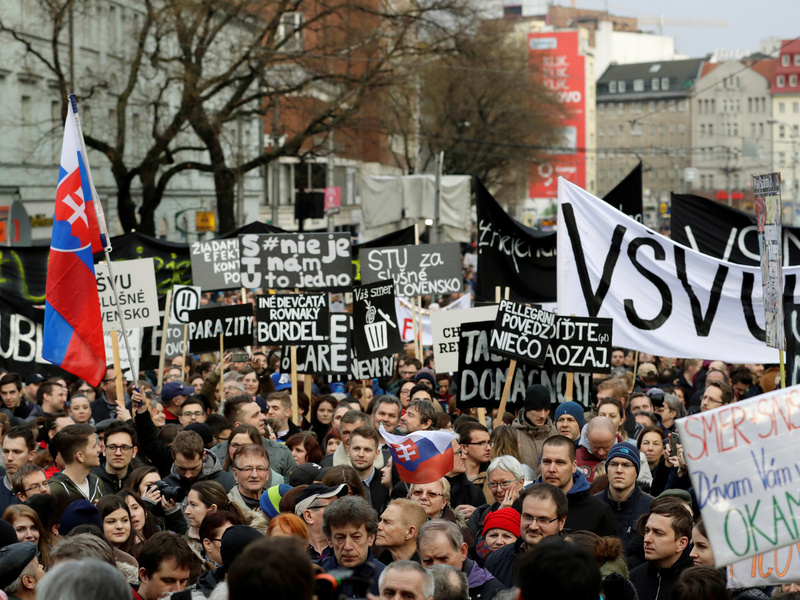 Demonstrators attend a protest rally in reaction to the murder of Slovak investigative reporter Ján Kuciak and his fiancée Martina Kusnírová, in Bratislava on Friday. Kusnírová was an archaeologist specializing in ancient history who loved animals, said her friend and fellow archaeologist, Peter Debnár. She, like Kuciak, was 27 and they had planned to marry in early May. Their friends describe the couple — who met and fell in love in college — as hardworking and socially conscious. The song they'd selected for their wedding is a melancholy ballad called "Sarajevo" by Czech songwriter Jaromír Nohavica about the Bosnian city ravaged in the 1990s during the Balkan war. Kuciak also wrote a poem for his bride-to-be in which he vowed to love her forever. Missteps in the subsequent forensic examination and criminal investigation leave a four-day window as to when the couple died, making the murders difficult to solve and ultimately prosecute. Habara says Kuciak often worked remotely and was last in the office on Feb. 21. His unfinished article, which his colleagues fact-checked and edited, has since been published worldwide. It documents Italian crime gangs infiltrating the poorer, eastern part of Slovakia and shady deals with local politicians and misappropriation of European Union money. The article links Mária Trosková, a former Miss Universe contestant and one of Fico's assistants, to Antonino Vadala, an Italian businessman living in Slovakia, who Italian authorities allege has ties to the 'Ndrangheta crime syndicate. Slovak legislator Viliam Jasan, who is in Fico's party and was part of Slovakia's state security council, is also alleged to have close business ties to Vadala. Trosková and Jasan announced on Feb. 28 they were leaving their posts until the murders are solved and vehemently deny having anything to do with the killings. NPR requests to interview Fico, his interior minister and other officials within Smer-SD were declined or did not receive a response. Seven male suspects were detained earlier this month — according to Slovak media, one of them was Vadala — but were released within 48 hours for lack of evidence. Fico, who has repeatedly accused reporters and the opposition of using the tragedy to further their own agendas, also held a news conference on March 1 offering a 1 million euro ($1.2 million) reward to find the couple's killers. The money was piled in neat stacks in front of him on a table. "I have to say that I felt a bit sick when I saw that," Habara recalled. It was "one of the biggest flaws I've ever seen in any kind of moral authority here in Slovakia." Many other Slovaks felt that way, too, said Ján Orlovský, who heads the Open Society Foundations in Slovakia. "It's like, you know, the little pot with the lid. So the pressure builds up and then something unexpected comes out. "It was a major mistake of the government not to say, 'We are very sorry, we will investigate and these people will be removed right away,' because that's their political responsibility," he added. "It was just another show of arrogance, like we can afford [to do] anything and you can't do anything." Except they did, said Juraj Seliga, who is a lawyer and one of the organizers of the mass protests calling for justice and early elections. Slovaks "are really sad, really angry young people were murdered like this. And they're really seriously suspicious that the reason for the murders was Jaán's work," he explained. When you have tens of thousands of people in the streets, "there is a real hope for change," Seliga said. Slovak prime minister-designate Peter Pellegrini is scrambling to form a new government. But the chance of early elections sought by demonstrators may have been thwarted when Fico and his cabinet resigned Thursday. At the moment, the man expected to be the next prime minister — Pellegrini — has 79 of the 150 votes in parliament. That means he can get a new cabinet approved and avoid a no-confidence vote, said Veronika Remisová, who heads the opposition OĽaNO caucus. "We will try to showcase the wrongdoings of the coalition and we hope that in the next election ... people will elect a better government." She, Habara, Seliga and many other Slovaks hope continued public pressure will force the current governing coalition out sooner. More demonstrations are expected on Friday.